Wahama’s Brodee Howard clears an obstacle as Point Pleasant’s Kaydean Eta gives chase during the 110-meter hurdles event held Friday, March 30, at Laidley Field in Charleston, W.Va.
PARKERSBURG, W.Va. — Statistically, it’s very impressive. 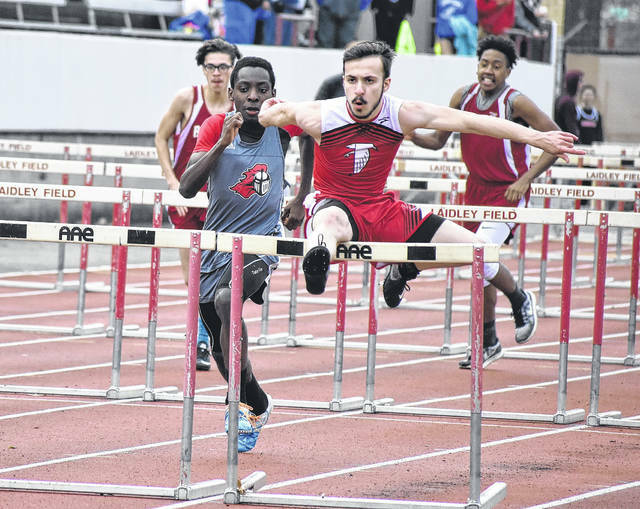 The Wahama track and field program will be sending 73 percent of its roster to the state tournament as 11 out of 15 athletes qualified out of the 2018 Class A Region IV championships held Friday night at Parkersburg South High School in Wood County. The White Falcons had seven top-three efforts en route to final tally of 51 points and a fifth-place finish in the boys competition, while the Lady Falcons earned a single event crown and a trio of top-three finishes while scoring 29 points for seventh-place in the girls meet. Williamstown dominated the Region IV meet as the Yellow Jackets posted a winning score of 146.5 points, while the Lady Jackets finished the evening with 201 points. The Ravenswood boys (111.5) were second out of 11 scoring squads and the Buffalo girls (104) were second out of nine scoring teams. Hannan did not advance anyone past the regional meet and produced only two points in the boys competition, which was good enough for 11th place. The Lady Cats did not score in the girls meet and had nobody finish higher than eighth in a single event. The White Falcons had seven different individuals qualify out in their seven state events on the boys side, which includes a two relays, two sprints, a hurdles race and a pair of field events. Only one state qualifier was because of an at-large bid. Brodee Howard was the Region IV runner-up in the 110m hurdles with a time of 17.12 seconds, while Christopher Hesson was also second in the shot put with a throw of 42 feet, 8½ inches. The quartet of Johnnie Board, Josh Frye, Jacob Lloyd and Brady Bumgarner were also the 4x200m relay runners-up with a mark of 1:39.52. The foursome of Board, Bumgarner, Howard and Zach Roush were third in the 4x110m shuttle hurdles with a time of 1:09.38. Board tied for third in the pole vault (7-6), while Bumgarner was the only multi-event qualifier individually after lacing third in the 100m dash (12.06) and fourth in the 200m dash (24.44). Jordan Fitzwater came away with Hannan’s lone points after placing fifth overall in the 110m hurdles with a time of 18.40 seconds. The Lady Falcons had their entire four-girl squad advance to state, and did so emphatically after coming away with the 4x100m relay title. The quartet of Skylar Riffle, MacKenzie Barr, Kaleigh Stewart and Camryn Tyree posted a winning time of 57.86 seconds. Barr was the pole vault runner-up with a cleared height of 7 feet, 10 inches. Stewart also placed third in the long jump with a distance of 14 feet, 11¼ inches. The Lady Cats got eighth-place efforts from Hannah Carroll in the shot put (25-6½) and Cassidy Duffer in discus (78-3). Visit runwv.com for complete results of the 2018 Class A Region IV track and field championships held Friday at Parkersburg South High School.